With the rise of creatives and design in ‘BAires’ (the edgy name for Buenos Aires), especially in the neighborhood of Palermo, as described in the previous post, it would seem fitting that good design would inspire a central, identifiable gathering place to inspire creative discussion. That would be Serrano Square (pictured). Surrounding the rather intimate square are no less than twenty restaurants, bars and clubs, all with outdoor seating. In the center of the square, local merchants provide their wares in an open market, with a children’s playground in the other half of the square – an ironic site at night in the middle of thousands of people walking throughout the square. On Sundays, the retail merchants present their merchandise along the sidewalks in front of their stores. Throughout my trip to Buenos Aires, I found myself returning to Serrano Square over and over, six blocks from the subway and connected via an extensive bus network. It was the natural meeting spot for creatives – the equivalent of the neighborhood coffeehouse, but as the neighborhood square instead. 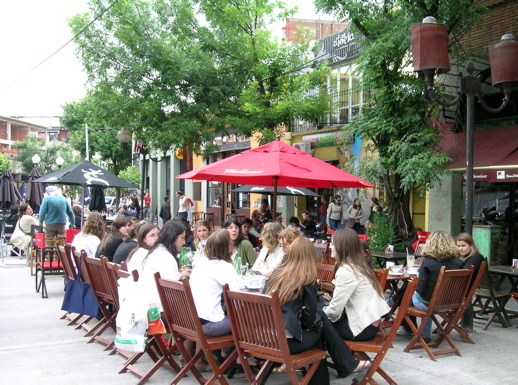 As its success and popularity continues to grow, it would seem a natural progression to allow the over-crowded outdoor tables to extend further into the street, replacing the auto-congested streets separating the diners from the square itself – perhaps similar to the pedestrian zone in Temple Bar, Dublin, Ireland.